The traffic and navigation app’s companion carpool finder, to begin operating statewide Tuesday, allows users to vet matches who travel similar routes. How do you convince people to consolidate solo commutes and trade solitude for company? Give them a few extra bucks, potentially faster trips and familiar faces in the car, according to a navigation company launching a new carpool app in Washington. On Tuesday, Waze will launch a companion app that connects drivers with riders traveling on similar routes. The service has been tested in Israel, Texas and California, but Washington’s expansion marks the first public launch. Traffic Lab is interested in your experiences forming carpools. How did you go about finding fellow riders? How much time or money did you save — or spend? Or maybe you tried it, but it didn’t work out. Contact reporter Michelle Baruchman at mbaruchman@seattletimes.com or 206-652-6588 to share your experiences. We may publish your story as part of Traffic Lab’s coverage of commuting. A similar app, Scoop, debuted in Seattle last April. In November, Scoop announced $36 million of venture-capital funding. Here’s how it works: Waze Carpool suggests commuting groups based on where people work and live, and allows only between one and five minutes of added commute time. Passengers build profiles for themselves with photos and information about employment, which Waze verifies through email. In-app chatting allows potential matches to vet each other, and a five-star rating system allows commuters to give feedback on one another. The platform splits trips by days, so individuals can plan commutes up to seven days in advance and account for changes in schedules, such as doctor appointments or late meetings. Users also can switch between riding and driving. And by sharing rides, drivers and passengers might save time on their commutes by using the carpool lanes. A passenger never pays more than 54 cents per mile, the IRS mileage reimbursement rate. Waze manages collection from riders and payment to drivers, and does not take a commission per ride. Instead, the company makes money by displaying advertising within its app. 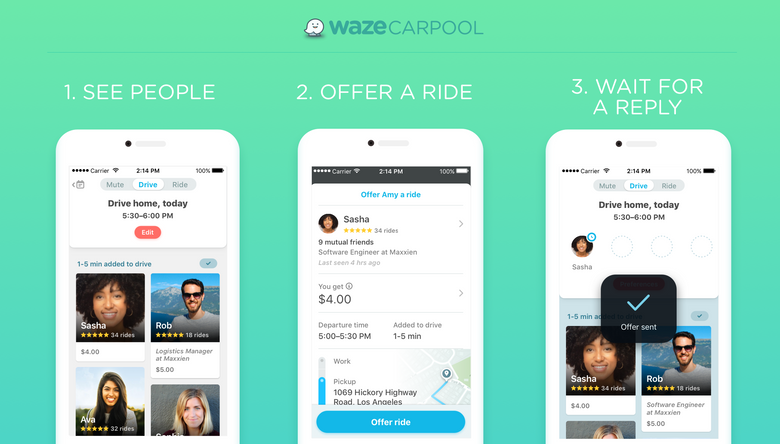 Waze declined to share specific numbers on usage, but Josh Fried, business head of Waze Carpool, said thousands of carpools a day have been completed in California. He’s confident in the expansion because there are about 375,000 active monthly users of the Waze navigation app in the Seattle area. King County Metro, the Washington State Department of Transportation and other state and local agencies voiced support for the service. With a statewide launch, Waze plans to take a hands-off approach, allowing use to grow organically. Eventually the company plans to expand across the nation. The success of that rollout depends on individuals changing their habits. “I want to reach a point where you would rather carpool than drive alone,” Bardin said. He thinks such a projection is possible because Waze already has built a community of people reporting traffic conditions.